As promised (or should that be threatened?) in my last entry, today it’s quilt story time. Mel and I made this one for Beth and Jeremy, who make it possible for us to hang out at The Usual Suspects, without which we probably wouldn’t have met in the first place. This quilt got its start early this year, when, inspired by the buzz following the announcement that TUS-Con was on, I got the idea and it wouldn’t go away nor did anyone I mentioned it to try to talk me out of it. No matter that quilts and summer in Vegas go together about as well as two things that don’t go together at all, I was determined to do this. I asked Mel to collaborate with me because that would make it more fun and less work, and she agreed to give it a try. Sure, we live in different states, but the Internet and jet travel make geography less of a barrier. We didn’t really get started until March, when we started exchanging ideas about the design. My first thought was to do a simple Irish Chain sort of thing, since all squares and rectangles would make it faster to pull together, and we wanted to include user photos as a major part of the design and they’re square already. Except then I saw a pattern from Quilters Newsletter Magazine that really appealed to me. Sure it had triangles (in two different sizes, no less), but it would make a much more interesting quilt. (And I rather liked the symbolism of the pointy bits representing how the board can get pretty prickly now and then as well.) Mel pointed out that it had rather a lot of triangles, which was true, but I promised to do the small ones and talked her into it. During this back and forth on the design, we were using my image directory on the web to share .jpg files. I was rather surprised one day to get an e-mail about them from someone who hadn’t even been contacted about the project yet, someone who was nice enough to give me detailed directions about setting up a password-protected directory on Dreamhost where we did the rest of our secret stuff. Once we had the design set, we started gathering user pictures from the board. We also e-mailed Suspects whose pictures looked very pixellated when enlarged to the 2-inch size we needed for the quilt or who were frequent posters who didn’t have pictures. It will come as no surprise to anyone who knows me that I tracked all this on a spreadsheet, complete with color coding to identify moderators and formulas to track how many squares we had filled and how many of those we had properly formatted images for. I like spreadsheets. While the image roundup was going on, Mel and I divided up the sewing tasks and got started making sub units. The black, white, grey, and red scheme we’d settled on made coordinating colors pretty easy– no having to match or blend with a focus fabric like has been the case with the group baby quilts I’ve done. Why those colors? They’re classic, for one thing, plus the default template for the board is grey and white and black with reddish accents. Also, we had no reason to think that Beth and Jeremy would hate those colors. I did the grey and red parts first. For the biggest grey pieces, I found a print that had pictures of a whole variety of things, which appealed to me because we talk about a whole variety of things on the board. There are babies and running shoes and cell phones and computers and baseball players and all sorts of other stuff on this fabric. 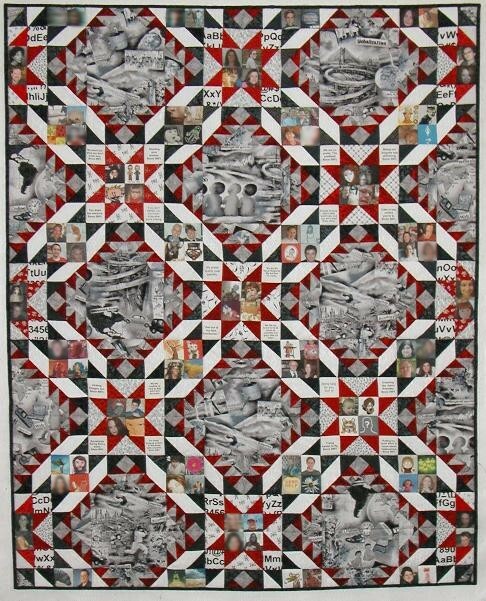 There are also several Y2K-specific bits, since this was one of many commemorative year 2000 prints that came out back then; I tried to cut around those parts when possible because this wasn’t a millennium quilt. For the small red triangles, I used a print with roses on it because Beth’s roses are a regular feature in the garden threads. As we finished our units, I cut and pasted images of them from digital pictures into Paint so we could get some approximation of how it might look put together and also so we could arrange the user photos to balance the hues in them (putting all the bright blues in one area just wouldn’t do, for instance). Once we were happy with the mock-up, I printed the user pictures as well as selected quotes from the FAQ and board taglines onto the magical Printed Treasures printer fabric. Then I went to visit Mel. I left any mention of sewing out of that entry, but there was a lot of it. We pretty much moved in to Mel’s mom’s sewing room right after we went to the quilt show and didn’t leave for a day and a half other than to eat and sleep. I even broke my “no sewing after 9 o’clock” rule. It was pretty intense but pretty fun, too. I was a little worried that it wouldn’t be fun, since it’s a lot easier for me to shop and eat and drink with someone than it is to work in close quarters on a quilt project. Fortunately, it worked out well. It took us a just little while to settle into a routine– Mel’s circuit training model proved superior, especially since she’s left-handed and I’m right-handed and when we tried the assembly-line model we each pinned exactly backward from what the person sewing was expecting. Things went more smoothly when we followed a set of pieces through the whole process, and it was very heartening to see that the units thus produced actually fit together with only a little bit of easing and tweaking needed. It’s too bad we don’t live closer to each other, since I’d be happy to work on a quilt with her anytime (and if we lived in the same place, we wouldn’t have to cram all our quilting time into one weekend a year). By the time I left to catch my plane on Sunday afternoon, we had the top entirely assembled and the back mostly done. The back is much more interesting than it would have been if I’d been left to my own devices, and now that I know how Mel does her great scrappy backs I think I might be a little bolder with my own in future. I used the Memorial Day weekend to finish the back and then layer and quilt and bind it. It went pretty quickly because I only did simple grid quilting– there was enough going on in both the top and back that anything fancy would just get lost (not to mention causing me to stress about getting it done in time for TUS-Con). The final touch was a big label (two, actually) which provided a key to which Suspects were where. Unlike my JournalCon swag, I was done with time to spare and didn’t have to try to smuggle a needle onto the plane. All in all, I’m pretty happy with how it turned out. The process was fun, for sure. A year ago, it was also quilt story time. Two years ago, I recalled my earliest memory.